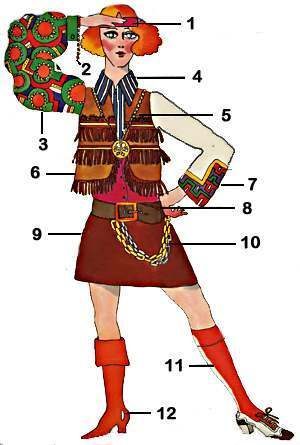 A quick reference on groovy dressing! 1. Pocahontas headbands – in! The curlier the hair, the better. 2. New place for beads, beads, beads! 3. Gaucho, gaudy and great! 4. The wider the collar, the better! 8. Belts – start collecting!